After weeks of planning, it was my sister’s baby shower last weekend and it was something of a triumph, even if I do say so myself 🙂 Of course I can take very little credit for it, really all I did was pull the pieces together, the rest was achieved through the online marketplace marvel that is Etsy! For anyone unfamiliar with the site, Etsy holds the title of the world’s largest handmade and vintage marketplace – with a community of 15million members, across more than 150 countries. And last month saw the launch of an exciting new feature a ‘category’ dedicated entirely to Weddings. The inspirational Etsy Weddings is designed to help couples create a uniquely personal day with plenty of original, handmade elements.With it’s pages overflowing with one off pieces of jewellery, exquisite millinery, stylish paper goods and even Wedding Dresses, Etsy Weddings offers a truly unique (not to mention quite addictive) shopping experience – a one stop shop for all your wedding needs! A top tip is to use the ‘Shop Local’ feature on the left-hand side of the homepage. This allows you to filter your search, thereby not only supporting your local Etsy sellers, but also avoiding the potential customs charges that go with ordering from abroad! Here are a handful of my personal picks from Etsy Weddings, some that have already been featured on CVB and some to keep an eye out for…. Loft Life Press – romantic stationery, full of adoring tiny details all in the prettiest of pallettes! 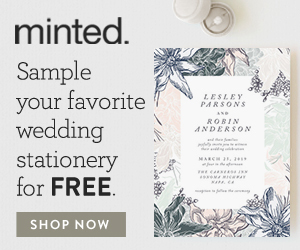 Dear Emma Stationery – the subject of one of my first posts, creates bold wedding invitations & reception papers customizable to fit your theme and personality! Twigs & Honey – it is impossible not to fall for the exquisite head wear of Myra Callan! Mignonne Handmade – inspired by nature, vintage fashion and art. Whichgoose – beautiful whimsical woodland crowns. SIBO Designs – inspired by her own search for the perfect hair accessory this lovely lady knows exactly what any bride is looking for! Erica Elizabeth Designs – Birdcage, English Silk Tulle, Lace, Bridal Caps, Feather Fascinators, or Silk Flowers this store has it all! Twigs & Honey – again, I know, I just couldn’t resist featuring one of their gorgeous veils as well. Delezhen – Delezhen creates beautiful handmade and affordable jewelry from gorgeous natural semi precious stones. Her pieces are quite simply perfect for wedding parties. Vintage Bella Bride – perfect for the bride looking for a piece with a little more history. Quirks & Crafts – have super sweet bridesmaid’s pieces that are just that, hand crafted and quirky. Noaki – creates heirlooms of the future from pieces of the past. Cake Toppers – I am still enamoured by the cute and kitsch bird cake toppers! Brides, and grooms, you can now find inspiration to shape your wedding vision and the special touches needed to help make all your dreams a reality – all in one place, Etsy Weddings. It also allows you to keep up to date with the latest trends and read expert advice and inspirational stories from real couples. I so wish I had found this site when I was planning our wedding back in 2010 – it would have saved so much fruitless searching, not to mention pennies. Have you found anything on Etsy for your wedding?? I would love to see the comments section full with seller recommendations! I am going to start it off with the lovely lady who designed all my sister’s baby shower stationery suite.